 BOMA is a concept, a place to live that we have created within the heart of the hotel. In Africa, a boma is an enclosure surrounded with wooden fences to protect the inhabitants and their animals from wild beasts. It’s a friendly place to meet around the fire to eat, dance and exchange ideas together… We’ve redesigned the concept for you into a large area with the restaurant, bar and shop all together… What kind of atmosphere is there? Ethnic chic, with high stools, sofas, armchairs, designer chairs, redesigned pouffes and high and low tables, both large and small… All you need to do is get settled in! 103 rooms in a profoundly ethnic chic style, inspired by the graphic photographs of African fashion. BOMA takes care of your sleep with its top-of-the-range bedding: Simmons BOMAtelas specially created for the hotel, HEFEL duvet made of Tencel, an environmentally-friendly natural fibre, DODO plant-based memory foam pillow. Street side or courtyard side, with or without balcony, each BOMA room has its advantages. Shower or bath, on request everything is possible. Let yourself be surprised or contact us! This is BOMA’s living environment, with the lobby in the midde and the lounge for hotel customers, and not only them! It’s also a place for non-residential customers, who love to come back to it… The BOMA is open to all from 7 am to midnight, and the atmosphere changes as the day unfolds, all to the tune of BOMA’s special musical playlist. Come for breakfast, work, lunch, a snack, for an appetizer, a dinner, an evening concert or live music – it feels really good to be here. 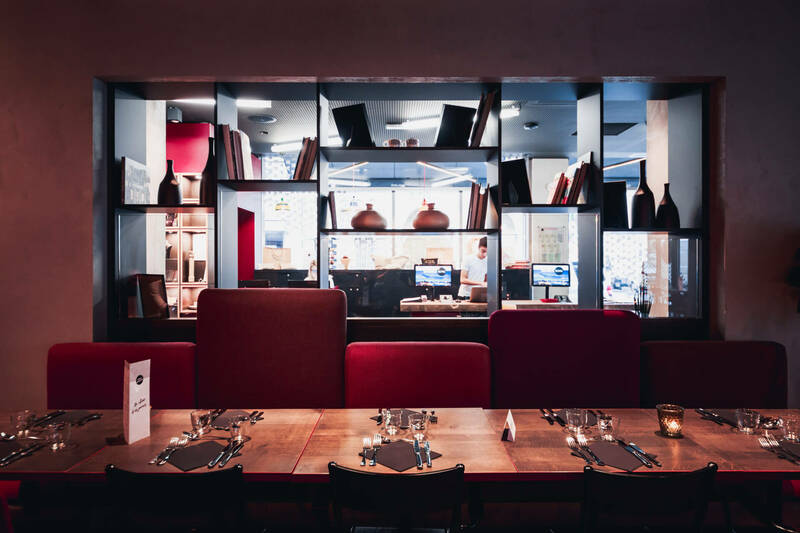 Our Chef, Cedric Kallenbach and his team use only fresh produce for their “house” dishes and Thierry Schwartz, the Michelin-starred chef, has prepared a fine selection of natural wines and chartreuses to accompany all your dishes – great and small. Taste them for the first time or rediscover them. What is the meeting room like? An area of 28m², with all-round windows overlooking one of the most attractive shopping streets, rue du 22 Novembre. Fully equipped, the meeting room will surprise you with its warm atmosphere, conducive to efficiency. Ideal for successul work. Possibility of meetings up to 20 people for all types of events. 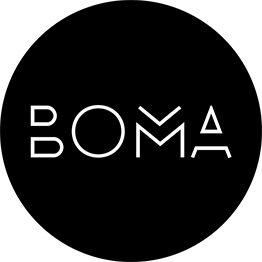 Contact us, BOMA can adjust to your need. In the BOMA Shop we select produts from local, French or African crafts: with Gigi Clozeau jewelry, Made by Papa, Ikhaya Mossy, small leather goods, Alsatian Alsatrucs products, Le Chat Dans L’Armoire candles, soaps and L’Esperluète cosmetics… BOMA also has fun by offering board games or naughty games, pouches and vinyl bags by Anne Charlotte Goutal and makes you relive your best moments by giving you the opportunity to buy items from your room or the bistro: phones, lamps, Villeroy & Boch personalized mugs, groceries (BOMAdeleine, tart of the day, wine, jam, honey…). The BOMA Shop, a must to have fun or to please. Open without booking every day from 6.30 to 10 pm. A private well-being bubble with top-of-the-range Technogym equipment: treadmill and exercise bike with individual screens, full range of bodybuilding apparatus, medicine balls and exercise mats. For those who prefer a bigger gym with cardio-training and bodybuilding facilities or who want to join a class, we have a partnership with the KEEP COOL gym. Please ask the reception. BOMA carpark: €24/night, places are limited and available on request, so don’t forget to book. The Kléber – Homme de Fer carpark: price negotiated for you: €18 for 24 hours (280 m – 3 min walk). The Centre historique Petite France carpark: €12 for 24 hours (650 m – 9 min walk). It’s easy, take the “Maire Kuss” street in front of the train station and keep going straight (550m – 8 min walk). Lines B and F – Stop at Alt Winmärik/Vieux marché aux Vins (180 m – 2 min walk). Lines A, B, C, D and F – Stop at Place de l’Homme de Fer (260 m – 3 min walk).